Results from a recent Botox experiment would have all of Hollywood frowning if they were physically capable. In a study published in the Journal of Biomechanics, researchers from the University of Calgary analyzed the effects of Botulinum toxin A — commonly known as the wrinkle-plumping cosmetic injectables Botox and Dysport — on a group of 18 rabbits over a span of six months. The Canadian researchers found that the limbs injected with Botox suffered muscle loss of up to 50 percent, reports UK’s Daily Mail. And cause for even greater concern was the discovery that muscle wastage also happened in other limbs that weren’t injected, which opens up the possibility that Botox can spread throughout the body instead of staying in place. Lead author of the study, Rafael Fortuna, concludes, "What we have shown is some muscle tissue is being replaced by fat. Basically, we should be more cautious. 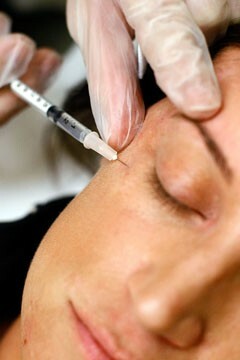 We should be aware once we have Botox, there might be some side effects far removed from the injection site." The research findings also raises questions about the long-term use of the wrinkle-blasting injection that over 2.5 million Americans used in 2009, according to statistics by the American Society for Aesthetic Plastic Surgery (ASAPS). After receiving FDA approval for cosmetic use in 2002, Botox injections became rapidly popular among the Tinseltown and jet-setting set, with more middle-income Americans ponying up for the approximate $300 to $600 per area treatment in recent years. However, the long-term effects of the drug as a cosmetic injectable have never been proven, due to the infancy of its use as a wrinkle relaxer. Possible short-term complications can include droopy lids and surrounding muscle weakness, though less than three percent of patients experience either issue. Both symptoms correct themselves over a period of days or weeks. The substance works by relaxing the contraction of muscles, which smooths out the skin that lays over the previously crinkled muscle. Results typically last between three to five months before the muscle slowly returns to its previous shape. But with Botox now possibly turning muscle to fat, we wonder: will celebs run faster from the "f-word" than from wrinkles? And for those who still aren’t deterred from injectables, make sure you’re not buying fake Botox.